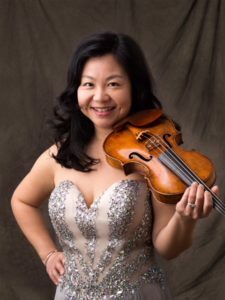 Joyce Lai Currently concertmaster and artistic director of the Canadian Sinfonietta, violinist Joyce Lai enjoys a career as a soloist and chamber musician. She has been featured as a guest artist with orchestras around the world, including the Toronto Symphony Orchestra, the Szeged Symphony Orchestra of Hungary, the Canadian Chamber Academy, and the City Chamber Orchestra of Hong Kong. As an avid chamber musician, Joyce performs regularly in chamber settings and has been featured at various festivals including the Clear Lake Chamber Music Festival in Manitoba, the Kitchener-Waterloo Chamber Music Festival and the Pender Harbour Chamber Music Festival in B.C. Joyce is also first violinist in the Riverdale Ensemble, a chamber group that specializes in performing rare and unique works, as well as premiering new Canadian works. The Riverdale Ensemble’s highly praised CD, Twelve by the Moon-dial, was released in 2008. In addition to her performing career, Joyce is also an enthusiastic educator as well as a pianist and has a private studio of violin and piano students ranging from ages 3 to 73. She has taught at the Hong Kong Academy for the Performing Arts and the Hong Kong Baptist University, in addition to giving violin clinics in the Ontario area. She is currently the conductor for the Canadian Sinfonietta Youth Orchestra (CSYO) Junior Strings. Joyce holds a Bachelor of Music Degree from the Manhattan School of Music and a Masters of Music Degree and Performer Diploma from the Indiana University.